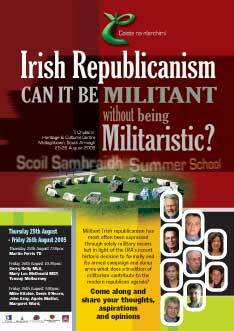 Irish republicanism: Can it be militant without being militaristic? Militant Irish republicanism has often been expressed through solely military means, but in the aftermath of Óglaigh na hÉireann's recent declaration to formally end its armed campaign and dump arms what does a tradition of militarism contribute to the modern republican agenda? Are there aspects of that past that are of benefit to the present? What of the fear in republican circles that the militancy of the republican struggle may well be lost along with the militarism? What of the fears of others that militant republicanism is inevitably expressed in military terms? Does participation in the peace-building discourse conceal or dilute the 'real' politic of republicanism? Or do the dynamics of an anti-colonial conflict and post-war politics share strategic commonalties? These are the questions that Coiste na nIarchimí, the umbrella organisation for republican ex-prisoner groups throughout Ireland, will debate in its third annual Scoil Samhraidh/Summer School to be held in Tí Chulainn Cultural and Heritage Centre, Mullaghbawn, South Armagh on 25-26 August. Pat McGinn, Sinn Féin Mayor of Newry and Mourne District Council will officially open the event at 7pm on Thursday and the impressive line-up of panellists from the political, ex-prisoner and academic world billed to speak at the event are expected to attract a large audience. Mike Ritchie, Director of Coiste, said that the theme of the summer school was a very relevant one especially in light of the recent statement by Óglaigh na hÉireann. "It's very much a live topic at the moment, viewed much differently depending upon your political outlook. As an organisation working proactively on behalf of former republican prisoners, their families and displaced people, you could say we have been 'militant' in our refusal to accept the status quo and the discriminatory barriers that currently impact upon the constituency we represent and deny them full citizenship. "In that sense we are carrying on the tradition from the prisons where republicans displayed their militancy, as opposed to their militarism, in a host of ways — the burning of Long Kesh, the blanket protest, the Hunger Strikes, the escapes, the education programmes, the handicrafts, the lobbying, the legal cases. This was not militancy for its sake alone but to challenge oppressive regimes, strive for intellectual and physical freedom and to create a better way to live with one another. Our challenge today is to continue that work at a societal level in an equally militant, if not militaristic, manner."